Konica Minolta are now adding a budget product range to their colour line-up. This is their response to the arrival in the market of cheap A3 Colour devices from the likes of Samsung and Kyocera. Frankly its simply a response to pricing challenges and is a defatured version of the main colour range. 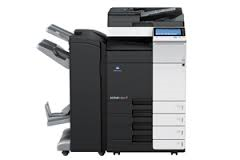 Konica Minolta remains the best value, the best quality and the most robust product line up but the budget range will not have the lifetime durability of the main range. If you are a low print volume user then this range will give you far better quality and value for money in comparison to cheap newcomers. The C287 is a full A3 colour multifunctional with a good level of features. Postscript is standard together with a 45 ipm scanning speed. Colour output is the best on the market and reliability second to none. This really is best value for your money and its in stock for next day delivery. The Bizhub C287 is available in the UK market as the Develop Ineo+ 227 and the Olivetti MF282.